Is this happening on HD 10180 b also?. Does anybody know? How far north can HARPS observe? It was my impression that the Kepler field is too far north for HARPS to be of much use. The faintness of the star can't be helpful either. Are the planet candidates below the radial velocity precision of 0.97 m/s ? Is that why they can not be confirmed ? HARPS can confirm HD 10180 b, it will just take more observations. How faint a signal you can pick out is a function of the square of your observations. You can detect a 1 Me planet with (20 · 82) = 1280 measurements. HARPS just needs to collect more measurements to build confidence in the RV signal of HD 10180 b. Regarding KOI-377.03, the star is dim, and there are only six RV points. More observations are needed, and may not be easy to get since the star is not bright. Stars that are bright will have a high Signal-to-noise (S/N) ratios and will thus have the highest RV accuracies. HARPS has been looking at the star (HD 10180) for six years, i don't know but they probably have more than a thousand measurements. The planet has an orbit of about 1.17 days. With KOI-377.03 can the Signal-to-noise be compensated with the 10 m Keck collection area. COROT-7b that is a little more massive, with similar orbit and farther away but more bright, was confirmed by HARPS in less time. I believe. quantanew wrote: HARPS has been looking at the star (HD 10180) for six years, i don't know but they probably have more than a thousand measurements. The planet has an orbit of about 1.17 days. According to the paper, they have 190 measurements spanning 2428 days. CoRoT-7 b is much more massive, and transits. You don't need as many data points to demonstrate that the RV signal is real when you already have transits to tell you that. Consider Kepler-9, if we had no transits, and just those six RV points, there would be no confident detection. 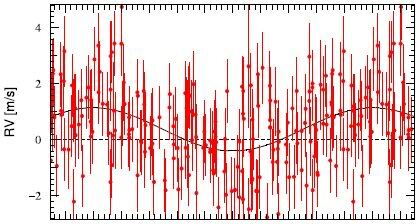 Here's the RV graph for HD 10180 b from the paper. They need more data to make sure that this signal is real. The curve makes it look obvious, but that curve isn't statistically significant enough to demonstrate that the signal is indeed there. Hence the need for more data to reinforce that fit. Yeah thank you i haven't read the paper in full. It makes perfect sense to achieve a statistically significant enough data to claim confirmation. I almost believe we where on a point where kepler can see the transits but they can not be confirmed because of instruments limitations. Thanks a lot for taking the time. I just have one more question what are the detection limits for an instrument like HARPS or HIRES.? In say masses and distance from the star. I was reading somewhere on this forum that in the HD 10180 system HARPS would see a planet of 10 earth masses in the habitable zone. Does this means it won't see anything below that? quantanew wrote: I was reading somewhere on this forum that in the HD 10180 system HARPS would see a planet of 10 earth masses in the habitable zone. Does this means it won't see anything below that? Sirius_Alpha wrote: How faint a signal you can pick out is a function of the square of your observations. The HIRES instrument has a detection limit at 1 AU of 0.2 MJ (Jupiter mass). It must be similar to HARPS. I'm not sure if stating this a third time will make it any more clear, but I'll give it another shot. There isn't a hard lower limit to what HARPS or HIRES can detect. Additional measurements allow for increasingly smaller planets to be detected.